I attended a very special dinner tonight - one that I feel obliged in sharing with the world. No, it wasn't cooked by a celebrity chef at Michelin-starred restaurant, nor were we drinking some bottles of ultra-rare wines. Rather, tonight's dinner was about doing good to help a community. I've known about Senpai's involvement, initially through the community services group of his former employer, with helping to revitalize Kamaishi (釜石市) - a coastal city in Iwate Prefecture (岩手県) and part of the Tohoku (東北) region affected by the earthquake and tsunami of 2011. Over the last three years I've seen postings of countless pictures about his visits to the region, including those taken while helping out at the annual Yo!sa Kamaishi Festival (釜石よいさ). I've received postcards from the region, and even tasted some sweets from the region hand-carried to Hong Kong by Senpai. He's devoted a chunk of his time over the last three years on this particular cause. Last year he began helping one particular local business expand its reach, and started exporting some seafood from the region to Hong Kong. One of our mutual friends has ownership interest in Ozawa (小澤), and readily agreed to serve "swimming scallops (泳ぐホタテ)" from Kamaishi. A few months ago, I received word from Senpai that the swimming scallops were now being offered at Heichinrou (聘珍楼). The second-generation family member in charge of the Japanese restaurant chain's business in Hong Kong is actually Senpai's and my kohai from our high school in Tokyo, and he had agreed to help out with this worthy cause. Unfortunately I never found the right opportunity to go and taste them, despite the fact that one of the restaurant chain's outlets is right across from my office. When Senpai asked me to join this dinner a few days ago, I knew what this meant and immediately agreed. Four years ago, just a month after the disaster, I wrote about two dinners that I had with friends with the specific goal of supporting Japanese restaurants in Hong Kong and Japanese produce. The best way to help the people of the Tohoku region was to support their economy by buying their products and making them self-sufficient again. Dining on these swimming scallops is one small way towards accomplishing that goal. We sat down to a multi-course dinner headlined by the swimming scallops. But first, Executive Chef of the restaurant group Steven Liu came to open a couple of the swimming scallops for us. They were gigantic. Iwate fresh scallop sashimi (岩手泳ぐホタテの刺身) - there are few way better than having live scallops served as sashimi, and this was delicious. But I wish they hadn't chopped it up into so many little pieces... Serving it in larger, thicker chunks or slices would have been so much more satisfying! Iwate scallop pan-fried with black truffle lemon sauce (岩手泳ぐホタテのトリフ・レモンソースの炒め) - pan-fried with enoki mushrooms (榎茸) in a lemon (and butter?) sauce with nice acidity. Topped with black truffle paste, spring onions, and garlic. The scallop was done mi-cuit. Very nice. Double-boiled squash-melon soup with fresh crab meat (鮮蟹肉節瓜盅) - The hollowed-out chieh-qua (節瓜) came with crab meat, ham, scallop, and kailan (芥藍). There was also bamboo pith in the soup. Classic Cantonese. Very yum. Steamed whole fresh spotted garoupa (清蒸東星斑) - the fish was pretty big, at just under 3 catties. Steaming a fish this size gets a little tricky, and I thought the flesh was just a tad overcooked... but still very delicious overall. No surprise that everyone asked for steamed rice and drenched it in the extra sauce that was provided to us. Deep-fried crispy chicken (手吊脆皮雞) - very nice and tender. Spiced salted mantis prawn (椒鹽富貴蝦) - a classic Hong Kong offering. I guess they can't really call it "piss prawn (瀨尿蝦)" at a nice restaurant, so it's now 富貴蝦. Fried with minced garlic and chili. The flesh was very delicious and sweet. I love it that the restaurant has already cut open the shells so that diners have easy access to the flesh underneath, and everyone got a pair of scissors in case more cutting is needed. Poached organic spinach with supreme soup (上湯有機莧菜) - my Japanese is pretty broken, but I believe the leafy amaranth comes from a hill farm in Jiangxi Province (江西省) in China. Very young and tender. Yeung Chow fried rice (楊州炒飯) - very good flied lice, with a lot more stuff here than I would expect from a normal Yeung Chow fried rice. After the fresh fruit platter, everyone got a "happiness sake manju (しあわせの酒まんじゅう)" that Kimigahora-san brought from Kamaishi. While these look like any ol' Japanese manju, they were actually made with the sake lees (酒粕) from the local sake in Kamaishi - Hamachidori (浜千鳥). I could definitely taste the flavors of the fermented rice... and a little bit of the alcohol. Very nice. 2010 Françoit Martenot Meursault "Les Hauts Bois" - ripe on the nose, a little sweet and honeyed nose, almost pollen-like, oaky, and buttery. Good acidity here. 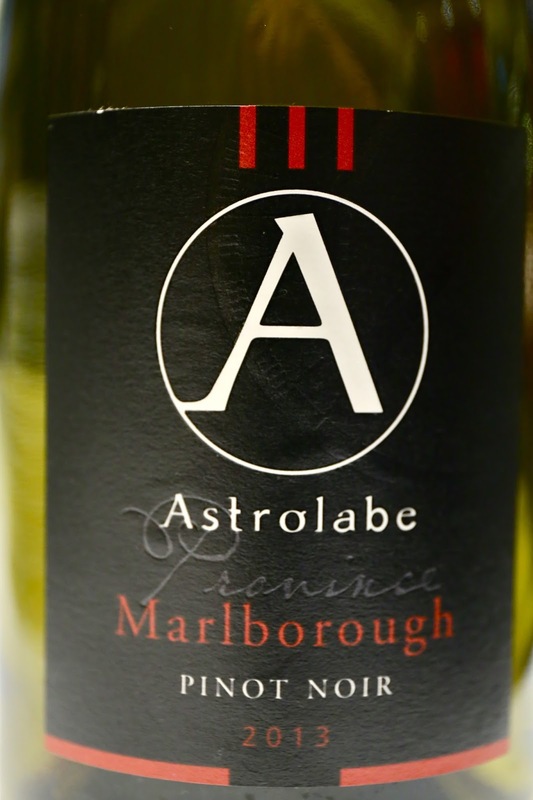 2013 Astrolabe Province Marlborough Pinot Noir - initially it smelled like cool fruit, with eucalyptus, forest pine, and very ripe and sweet on the nose. Also pretty ripe and sweet on the palate, too. Definitely a new world pinot. I felt very privileged to have been at this dinner, meeting Kimigahora-san and learning about the collaboration between his company and Heichinrou. The scallops were very, very delicious, and given that the restaurant is about 2 minutes from my office on foot, I should be going back more often! I would also encourage everyone in Hong Kong to go down to any of the 4 Heichinrou outlets and check out these giant swimming scallops for themselves. Not only will you find the scallops delicious and enjoyable, you will also be doing your small part to help in the recovery of a region hit hard by the 2011 earthquake and tsunami.